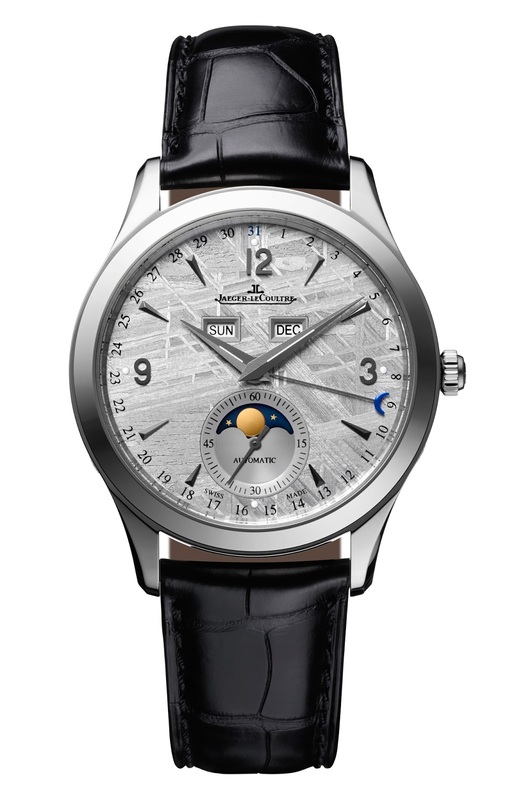 Jaeger-LeCoultre has given its signature Master Calendar some extraterrestrial flair with a dial made of a thin slice of meteorite – all for an attractively small extra cost compared to the regular model. 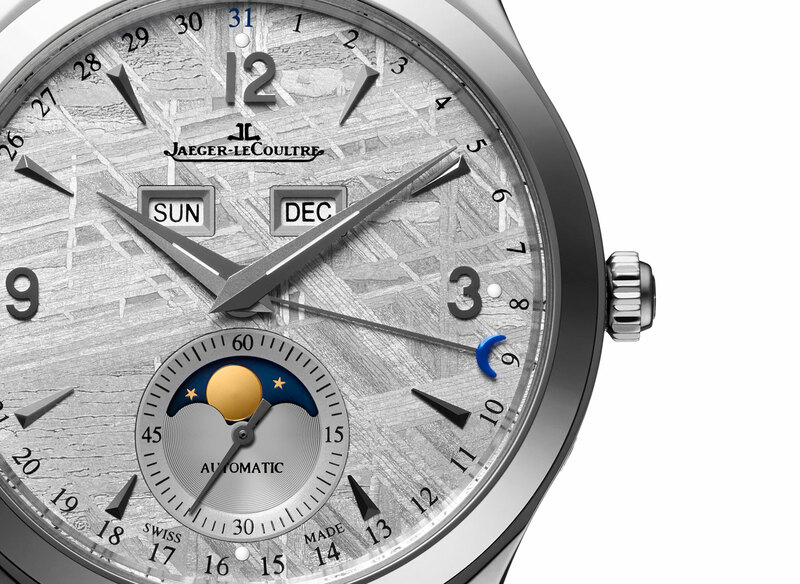 SIHH 2015 will see Jaeger-LeCoultre present several calendar and astronomical themed timepieces, one of which is the new Master Calendar with meteorite dial. Launched two years ago with a conventional silvered dial, the Master Calendar has the traditional triple calendar layout with three windows and a date pointer. That is now made a little more interesting with a dial made from meteorite discovered in Sweden that originated much farther afield, from the asteroid belt between Jupiter and Mars. The dial is made from an iron meteorite, the type most commonly used for watch dial. Sliced and then etched in acid, the material then reveals the distinctive, brushstroke-like Widmanstätten pattern, formed by the iron-nickel crystal in the meteorite, that make for a unique and attractive dial. Though exotic, meteorite watch dials are neither rare nor new. They began appearing in watch some twenty years ago, with Corum and Rolex prominently promoting watches with such dials. Dial aside the new Master Calendar is identical to the regular model. Case dimensions remain 39 mm wide and 10.6 mm high, with the self-winding calibre 866 inside. It is available in rose gold or steel. Best of all this does not cost very much more than the regular model, reflecting the straitened times for the watch industry. The price premium for the meteorite dial is small – 5% extra for the steel version and 10% for the gold. Prices for the meteorite dial Master Calendar are 16,000 Singapore dollars in steel and 33,100 Singapore dollars in rose gold. 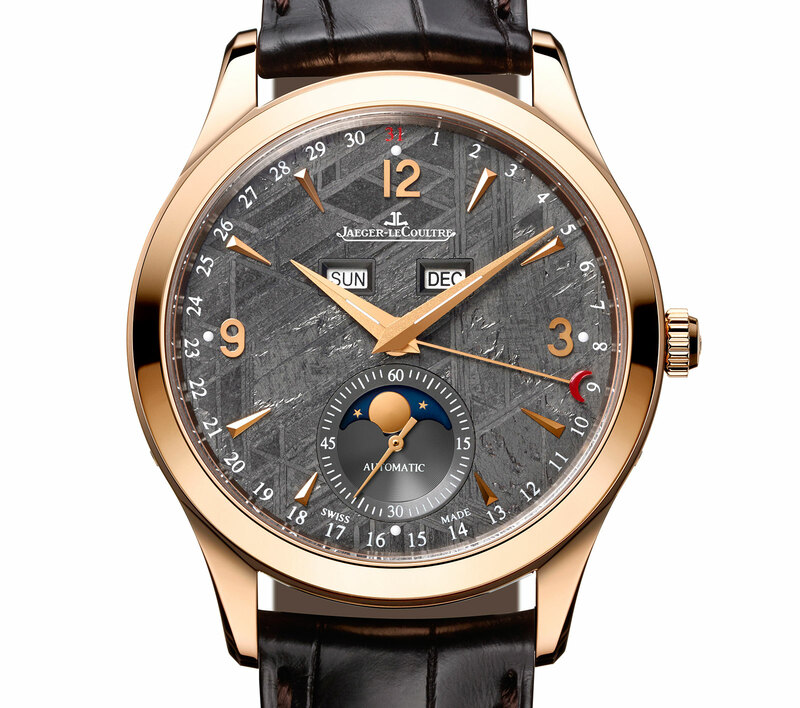 With the Master Calendar Meteorite, Jaeger-LeCoultre has bestowed a dial made from a thin slice of cosmic rock on one of its signature triple calendar wristwatch.